Apostolic Titbits: Waiting For Your Harvest? Have Faith! Waiting For Your Harvest? Have Faith! "9 And let us not grow weary while doing good, for in due season we shall reap if we do not lose heart. 10 Therefore, as we have opportunity, let us do good to all, especially to those who are of the household of faith." (Gal 6:9-10). Think about it for a moment, what if a farmer who tills the ground, waters the ground and softens it to plant seed, then plants the seed and then waits for a couple of days to see whether what he has sowed has grown or not, and then sadly he packs up his belongings to go to another place discouraged that the harvest has not come to him inspite of all his hardwork. We will say that it is plain foolishness for such a farmer to go away like that empty handed, if he had just waited for a while [which may be days or months] to persevere and water the seeds which were sown, he would have had a great harvest with joy and would have received his reward for all his hard work. Hello dear friends, this is the same God is telling to those who do something for God and still don't see the blessings of God in their life. They ought to need to wait for a while in faith instead of throwing their precious faith away and go in unbelief to some other unfamiliar territories which does not give them any supernatural satisfaction or reward. We may have to wait in faith for a year, two, three or even a lifetime, but God's reward for sowing his faith seed of His word in our heart will definitely come to harvest time of happening without an iota of doubt. Till we see the promises of God come to pass in His appointed time, we need to pray in the Holy Spirit and strengthen the faith to grow and be rooted in us for fruitful harvest. 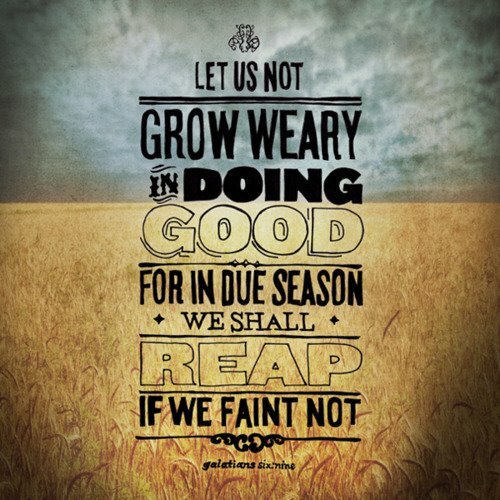 Once we do this as a good spiritual farmer, in the appointed time of God we will reap God's undeserved favor and blessings with much joy of the Lord within us. To work for God is to do good to to all the people in the world and especially to those who are of the houshold of faith which is the Church of the living God. Bless all people by sharing what God has spiritually, intellectually, physically, financially and socially given to you already, then expect God to act in your life supernaturally and bring his blessings in to every realm of your life. I promise you, very soon people will call you blessed! Those clouds of witnesses till now who waited and expected God to reward them, never even for one time failed to receive God's reward for their audacious and unflinching faith. Some of them missed their reward on earth but they received a eternally lasting and more invaluable reward than the earthly ones. The more we wait patiently without growing weary, the greater the value of God's reward keeps increasing for sure. You can never go with God beyond your faith. So, Keep up your faith!